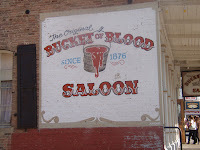 According to the Virginia City literature, this is the largest and most photographed landmark. 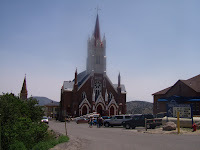 What I thought was interesting was the photo inside that showed this place as a huge and thriving city once upon a time...this Catholic church was built by an IRISH miner who, 20 years later, became the first bishop of California. 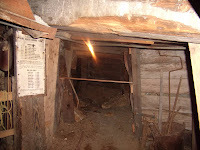 We went on a mine tour. Not as intersting as you - or we - would think. Walked crouched over for awhile - which made us realize why the Welch and Cornish men were good miners (my grandfather's side is Welch). Wanted to get my son a tshirt from here. 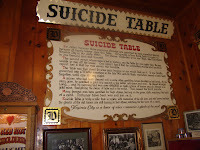 But it closed down when the town rolled up the sidewalks....lots of saloons in town. Of two genres....a big empty room with old photos and a bar....or a big empty room filled with slot machines, old photos and a bar. This was the latter so thought it would be open. It wasnt.